How do you choose between your family and the love of your life? 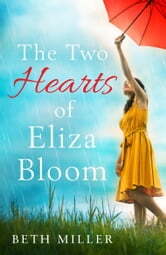 When Eliza meets Alex, her heart skips a beat. He isn’t Jewish, he lives in the wrong side of town, he has an enchanting smile… and he offers her a way out. So, Eliza takes a huge leap into the ‘Real World’ where there are new foods to try, movies to watch and someone who really loves her. An uplifting and heartbreaking novel about finding yourself, perfect for fans of Jojo Moyes, The Hideaway and P.S. I Love You.